For a unique twist on the traditional Irish Claddagh ring, this stunning piece of jewellery from Cailin is a wonderful choice. 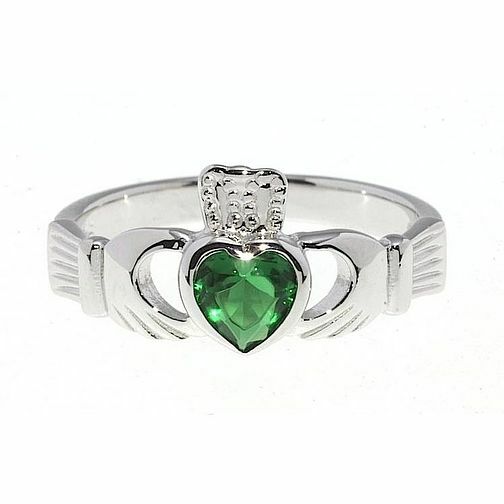 Crafted from sterling silver, the central heart of the Claddagh, featuring a crowned heart clasped between a pair of hands, is embellished with a vivid green cubic zirconia for stunning colour and sparkle. Ring size P.
Cailin Sterling Silver Green Cubic Zirconia Claddagh Ring P is rated 1.0 out of 5 by 1. Rated 1 out of 5 by Anonymous from Appalling quality silver ring I received this ring as a gift, and I was pleased with it originally as it looks very pretty on, however after around 3 days I noticed the silver flaking off all over the ring, despite my taking it off when showering and washing my hands. Extremely disappointed and would have expected better quality for the price of £40 and the ring 'supposedly' being sterling silver.